With Confidence are one of those bands for whom everything has just fallen in place so perfectly it’s almost unbelievable. Since forming in 2012, the Aussie pop-rockers have seen themselves supporting fellow countrymen 5 Seconds Of Summer, received national airplay on a handful of Australian radio stations and, most recently, been snaffled up by genre figureheads Hopeless Records for the release of their debut full-length Better Weather. And with such a fairytale-like story of their rise, you’d expect their debut to come as the happy ending. Well, it kind of is, because Better Weather proves that as of yet, With Confidence aren’t quite the finished article. While the band show heaps on potential on this album, they can occasionally sound a bit too unfocused and can’t avoid the traditional debut album traps. Looking past the cosmetic issue of it occasionally feeling much more sugary and polished than preferable (though most of the time that is really easy to look past), there’s the odd attempt at exploring different avenues that feels like a missed opportunity at success. Waterfall rounds the album off with its toned down patter that feels strangely stunted compared to what precedes it, and Long Night fills the role of obligatory piano ballad that cuts off any momentum. But in a wider context, these don’t cause too much of a problem. With Confidence definitely have a stable footing on this album overall, sonically reminiscent of mid-2000s pop-punk acts like Boys Like Girls whose main selling point was mass crossover appeal. It’s in this respect that With Confidence can be likened to Against The Current, both in terms of ambition and their shared sonic umbrella. But Better Weather spectacularly leapfrogs over their debut in terms of quality thanks to a far more organic instrumentation that is so much more palatable. And even while the seldom screams that pepper this album are ridiculously feeble by comparison to other bands, at the very least they betray an intent to try something a bit away from the norm. Plus, it’s hard to really dislike With Confidence too much, as Better Weather has a clutch of legitimate summer bangers at its disposal. Voldemort and Keeper are the sort of neatly-packaged anthems that would go down a storm on Warped Tour, and We’ll Be Okay‘s unashamed simplicity and staccato lilt only amplifies its catchiness. Nothing else really hits these same heights, but Better Weather doesn’t skimp on quality moments, even verging on a more progressive, adventurous take on pop-rock. Dinner Bell scrapes off a bit of its sheen and replaces it with a great mid-paced bounce, while Keys packs in a surprising amount of emotion and passion in its vocals. But as impressive as Better Weather is, all the way through it feels as though With Confidence still have a lot left to offer. They’ve shown that they can do both simple pop-rock gems and something that adds a bit more variety to the genre, but right now they’re both still two sides of a coin rather than a cohesive mesh. But while that’s something to strive for, Better Weather does exactly what a debut album should – it shows off the range of With Confidence’s talents, and though it sometimes stumbles, it draws attention towards their positives. And for now that’s good enough, but album number two will be where things really take off. 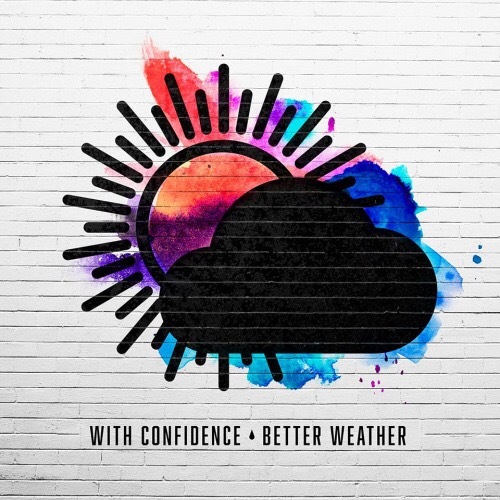 ‘Better Weather’ by With Confidence is released on 17th June on Hopeless Records.